Buddy was our second foster dog. He was about 10 months old when we got him. A big puppy! 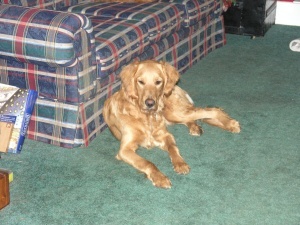 His former home was not able to give him the space or time needed for a young active dog. 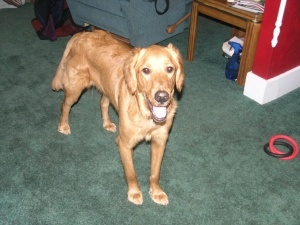 Since he was a puppy, he was active and playful. He actually would tire out our Cinnamon! He learned quickly and always wanted to please you. His only downfall was he would like to chew on blankets if he was bored. 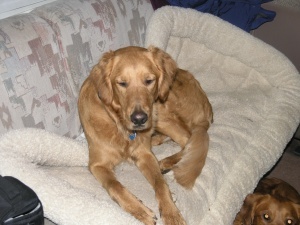 Soon after Buddy’s photo was placed on the Golden Bond website, there were people interested in him. We found the perfect family for him up in the Seattle area. 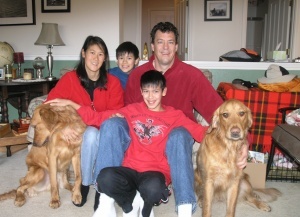 A family with two young boys and another Golden Retriever named Cedar with a nice backyard. It was hard to let him go, but we know this was the perfect setup for him! We have kept in touch with his new family over the years. Unfortunately his buddy Cedar passed away early in 2017, and Buddy himself went blind. Buddy crossed the Rainbow Bridge in 2017.